So... The studio has been missing an essential piece of hardware, which, in past recordings, we've wished we had. Well, that problem has now been remedied. After much hum-hawwing about what should be done to get our hands on a good figure 8 microhpone, we found the CAD Trion 7000. The microphone is precisely what we needed. After putting it through some trials of electric guitar, acoustic guitar, and vocals, we've come to appreciate its very warm, round sound. It captures the sound very well, and very accurately. 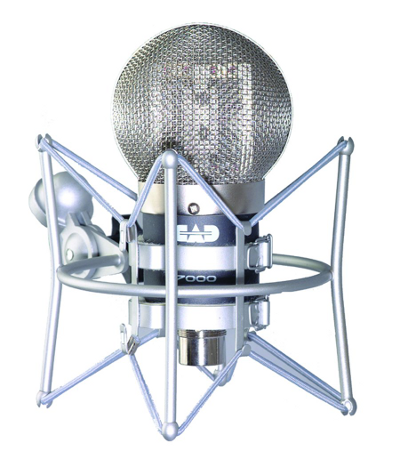 While most condenser mics (and some ribbons) tend to color the sound, the Trion 7000 leaves it very much in place, and ends up with a full-sounding, accurate reproduction of whatever is being recorded. Some would warn of phasing problems with this mic, and while this logically should be true, due to the dual ribbons, we haven't noticed any problems of this nature at all. Even using it as a side-mic in a Mid/Side pattern on acoustic guitar, the result is a gorgeous, very round (almost dark) ambient sound. When combined with a brighter mic as the Mid, the stereo sound is amazing. So yeah.. Even though it looks like a little alien spaceship, we love our new addition, and can't wait to use it more.